Zytech Solar, a Spain-based manufacturer of solar power systems that is highly versed in photovoltaic-based technology and innovation, presented its solar solutions at the SNEC 5th International Photovoltaic Conference and Expo, Feb 22nd – 24th, at the Shanghai NewInternational Expo Center. Zytech Solar presented what proved to be an attractive photovoltaic portfolio at the company’s specially designed booth. Different solar solutions that incorporate high quality-reliable Zytech PV modules, Solar Kits, Building Integrated PhotoVoltaic (BIPV) arrays, the all new Solar Street lights system and its range of Small Wind Turbines were shown in an informative environment providing visitors a real life experience of PV technology today. This was the 4th year that Zytech Solar participated in a PV Expo in China, which events are getting an increasing amount of attention from overseas with foreign visitor numbers multiplying year-by-year as recognition of the solar market in China develops. The show at Shanghai offered an excellent opportunity for networking within the industry. Zytech thanks all visitors and guests for coming by our booth. 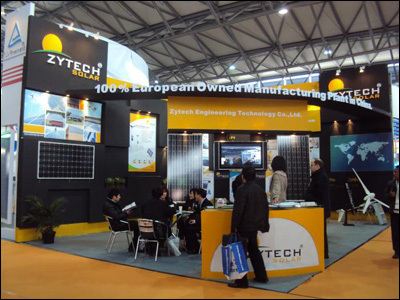 Zytech Solar, with headquarters in Spain and operations in Germany, France, Italy, BENELUX, the U.S., and China, is a well recognized photovoltaic module manufacturing company. Consistent quality management and a state-of-the-art R&D department guarantee highly efficient long-lasting products and systems. Zytech photovoltaic modules are extremely efficient and robust and offer excellent value for money. This is the reason why the company uses its slogan “European Quality, Best Prices”. Zytech is a Spanish-U.S.A. Group with worldwide manufacturing subsidiary companies making: PV modules, CPV, BIPV, Off Grid PV Systems, Small Wind Turbines, Solar Street Lights and Electric Powered Vehicles.